Unless you live someplace incredibly warm and sunny, you've probably been dealing with needing to clean your car this winter. If you've encountered snow and ice, you've probably noticed a lot of excess dirt and grime on your vehicle from slag/salt, and the like. Keeping the roads safe during the winter means extra work for car owners. Knowing how and when to best clean your car after experiencing winter weather can save you time and headaches down the road. You might find it impossible to keep your car clean this time of year, especially if you live in the north, where there is a lot of continuous winter weather. 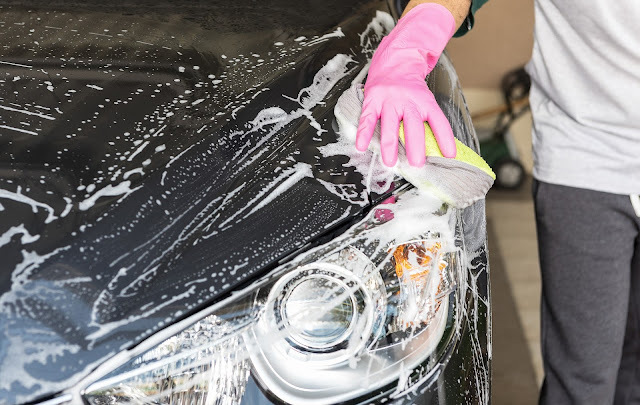 Constantly washing your car can cause unwanted damage or problems, so it's best to wait until you know that a winter weather event has passed before you attempt to clean your car at all. It can be tempting to take your car through a drive-thru wash, but when you don't know what types of products are being used to clean your car, it can cause problems in the future, such as stripping off the finish or leaving the car looking dull. The DIY method is safer, cheaper, and much more satisfying. We get it, you don't want to do it yourself. It's cold outside, and you have to wash the car outside, right? Best time to wash the car is in the sunniest/warmest part of the day. Go for 2-4 pm when you know the sun will be its warmest, and dress in layers! Grab two large buckets and fill both with water. In one bucket, add in some of your favorite car shampoo. Mix well, and then begin to slowly work your way over the car with a good quality wash mitts or even a microfiber towel. This will be oh, so gentle on the exterior! Start at the top and work your way over and down. Give a gentle rinse with water. Next, you'll want to hand dry the vehicle with good quality drying towels. Again, clean microfiber towels are a great choice. Finish up with a gentle sealant or wax mist. You can quickly and evenly spray a gentle mist coating over the exterior and add up to a month of extra protection. Once you've tackled the exterior, you might as well give the interior a good cleaning, too. We'll save shampooing and deep cleaning for springtime. For now, vacuum out those leaves that have collected on the floor mats, and clean out any loose items or debris that have found their way inside of the car. Wipe down the dash and empty the trash can. Add a fresh air freshener to breathe new life into the car, and you'll be good to go. How often should you do this? Depending on the extent of the winter weather you experience in your area, you'll want to clean your vehicle this way at least once a month... six weeks out would be the longest I'd go without giving a good interior and exterior cleaning. Spring is just around the corner and soon you'll be enjoying a nice drive with the windows down! Brought to you by Efird Chrysler Jeep Dodge.